Us Dutchies are in a constant battle with water, one we will probably never win (if you need an in-depth historical Dutch context, I can highly recommend Matthijs van Boxsel's Deskundologie - Domheid als Levenskunst). We might be good with dikes, but that doesn't change the fact that about 20% of Holland should be flooded (as it's below sea level). The University of Delft probably understands and appreciates this dangerous fact, as they're running a design-competition for sustainable floating homes. They do this in cooperation with Deltasync, a spin-off company of the university who know their way with floating homes. The awesome thing about this competition is that the winning student will actually be able to see his or her design built and floating! 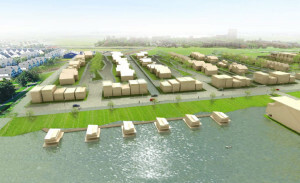 1 Spot at the Harnaschpolder is reserved for the winning design. Just to be clear, before you start glueing matchboxes together: this competition is intended solely for students at Delft University, students who probably know what they're doing when they're asked to design a floating house. The designs will not only be judged on 'floatability' (an important property when you live on water), but also on sustainability. The deadline for final design submissions is the 15th of June, after that the judging will begin, and I suppose that's around the time we'll get to see some results... Of course, we'll keep you updated!